It’s that time of the year once again when we boost our campaign to help the kids in earnest. This is our 18th year of caring for destitute children, including those abandoned, orphaned, abused and/or handicapped, and we help them with safe shelter, educational opportunities, specialized schooling for the disabled and distribution of foodstuffs. Last year, thanks to your kindness, we were able to allocate 4,510,415 baht, or 90% of the net raised, to our projects. Over the past 17 years you have helped us assist at least 79 different organizations benefiting children. Our Target Charity: The Fountain of Life Center in Naklua (2,475,596 baht): Under the auspices of the Good Shepherd Foundation (Registered Charity No. Tor 460/2543), we provide children with documentation, education, life skills, meals, medical/dental care, and ultimately, scholarships for government schools at the kindergarten and primary levels. Next Step Program: We provide children and young adults with scholarships to continue their education at the secondary and tertiary levels, including vocational colleges and universities. Since 2009, there have been 12 candidates who graduated from university, including one who completed his Masters in Law. Camillian Home in Lat Krabang (700,000 baht): In a joint venture with the Canadian Jackalope Open (CJO), we provide the 24/7 care for two severely disabled HIV-infected children, and now a third child with cerebral palsy, who is learning to walk. 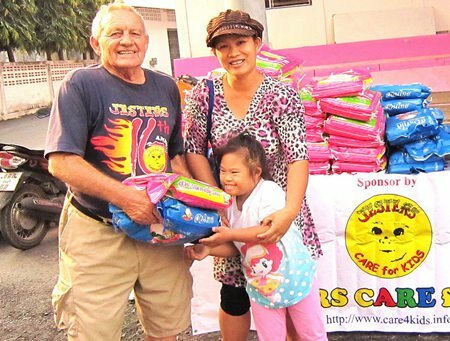 Camillian Social Center In Rayong (24,454 Baht): Along with the CJO organizers, we sponsor children to go on Christmas sprees at Big C in Rayong. Ban Jing Jai Foundation in Pong (360,000 baht): We provide a monthly stipend towards the food costs for 80 orphans. Share Love With Friends in Nong Prue (254,465 baht): We provide monthly rice distributions to poor families with disabled children, including wheelchairs and walking aids. We also help modify their motorbikes with sidecars to accommodate traveling with their special children. Khao Baisri Special Education 12 for the Disabled in Sattahip (125,000 baht): Though we have done extensive work here, this past year, we continued a monthly stipend for basic necessities. Anti-Trafficking and Child Abuse Center (ATCC) In Nong Prue (53,200 Baht): We provided scholarships for four children and also replenished their rice supply after their cache was spoiled by floods last year. Ban Chang Hospital Outreach Program (49,000 baht): We provide assistance to special children cases, as well as school supplies and uniforms in cooperation with Pattaya International Ladies Club (PILC). Special Olympics Thailand (Sot) in Pattaya (100,000 baht): We sponsor the Eastern Region Athletics Championship at School #7 for disabled children competing in track and field, and bocce ball. Kharma Foundation (50,000 baht): In a joint project with Ray Matti, we provide funds to improve conditions for children and their education; this year they focused on the far southern provinces. Kate's Project in Nong Prue (10,000 baht): We provide funds for food and donate event shirts for their annual Christmas celebration for the poor families. Santikam School in Nong Palai (40,000 baht): We provided additional toilets in cooperation with Pattaya Sports Club (PSC). Pattaya Schools No. 5 and 9 (30,000 baht): We provided eyeglasses for 250 children in cooperation with PSC and YWCA. Huay Yai School (50,000 baht): We provided funds towards building a kindergarten with YWCA. Children's Fair Event Shirts (162,300 baht): We donated 541 event shirts to our project children. Children's Fair Coupons for Project Children (21,400 baht): We provided kids with passes to play games, rides and activities. YWCA (5,000 baht): We sponsor their fund-raiser ‘Run/Walk Event’ for children’s causes. If you would like to join us this year, you can send your donations to the Good Shepherd Foundation, Bangkok Bank, Muang Pattaya Branch, acct # 484-0-68306-6, Swiftcode: BKKBTHBK. Official invoices and tax receipts are provided. If you would like more information, please visit our website at www.care4kids.info and/ Facebook: Jesters Care for Kids.